The sinking of the Titanic was an event that impacted many different lives from around the world. Losing 1,517 people during the disaster is enough to send chills down one’s spine of anyone who experienced the vent as well as Titanic enthusiasts looking to find out what it may have been like being a passenger on the largest ship of its tie. Always fresh in the minds of historians as well as Titanic enthusiasts are the events that occurred and exactly how the Titanic wreck occurred. Since history has given us very few Titanic survivors stories, it is important to preserve these videos and share them with the rest of the world. The first video is the story of the builder’s daughter Eva Hart whose family was on the way to Canada from England when the Titanic sank. Hearing stories of the good times of Canada, Hart’s father sold his building business and boarded the Titanic in search of better opportunities in the Great North. When the Titanic struck the iceberg, Hart explains how her father immediately know something was wrong and headed directly for a lifeboat. He told his daughter “Stay here. No matter what anybody says stay here and I’ll see what I can find out”. Because of her father’s perseverance and her mother happening to be awake, Hart and her mother were placed n a lifeboat and escorted to safety. Boarding lifeboat number 14 which was commanded by fifth officer Lowe, Hart explains the overcrowding and the panic of those still on the boat. Watching the Titanic sink, she speaks of horror beyond imagination as the fully illuminated ship began to sink in the pitch black of night. It has become light by the time she arrived to safety in the lifeboat. Frantically looking for her mother, she describes the amount of shock and horror among the individuals who had been escorted to safety. In the final video, Eva Hart recalls the aftermath of the Titanic wreckage. 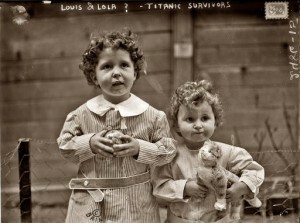 Refusing to go to sleep after being rescued, she got to see the full capacity of the horror of the Titanic wreck and the reaction of families who would be shattered forever. Having met Captain Smith, Lawrence Beasley, and other important figures on the Titanic, Hart is one of the most interesting survivors of the Titanic wreck and provides a perfect glimpse into what it meant to survive the Titanic disaster. When Did the Last Titanic Survivor Die? yes hannah yu are very rightt, it was very sadd ): buut i love yu nd im with yu in school right now !!!!!! byee lovee ! Next post: How Many People Died on the Titanic?